Question: Why do lava lamps bubble? Hypothesis: We predict that the lava lamp will bubble due to the reaction cause by adding the effervescent tablets. 1. 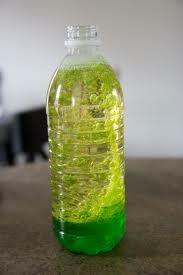 Pour the vegetable oil into the bottle until it's 3/4 full, top off the last bit with some water. 2. Add a few drops of food coloring, of your choice. 3. Break the effervescent tablets. For smaller bottles use only 1 effervescent tablet. 4. Drop the tablets into the bottle. 5.Loosely screw the bottle top back on and it should start to fizz up. 1.Make sure you don't put to many effervescent tablets in the bottle or it will over flow. First, the oil floats on top of the water because it is lighter. Second, the bubbles are less dense than the oil, so that allows the bubbles to float up. But, when they approach the top they become denser and sink back to the bottom, creating a repeating pattern.When Alka-Seltzer tablets are dissolved in water, bicarbonate forms (from the sodium bicarbonate), which in turn reacts with hydrogen (from citric acid) to form water and carbon dioxide gas. Conclusion: In conclusion, we determined why lava lamps bubble. They bubble because when the tablet starts to dissolve in the water, they begin to fizz. The fizzing is carbon dioxide gas, which forms bubbles that rise up through the bottle. My name is Noelle DeMarinis.My hobbies are soccer,lacrosse, figure skating, surfing, and playing the electric guitar.My favorite subjects in school are math and writing. My name is Dahlia Pepe. My hobbies are soccer, drawing, chess and lacrosse. My favorite subjects in school are math, reading and writing. My name is Nico DeMarinis. My hobbies are hockey, lacrosse, skiing,and playing the electric guitar. My favorite subjects in school are math, science, and reading.